ACP 14mm potentiometer series expands its range with the launching of the new round potentiometer version called CAR14. Keeping the same functionality of the current 14mm models, the shape is different. You can find, ready available, this new potentiometer with round shape, in Carbon (CAR14), Cermet (CER14) technology and it could work as Rotary Sensor version (RSR14), up to 1.000.000 cycles. 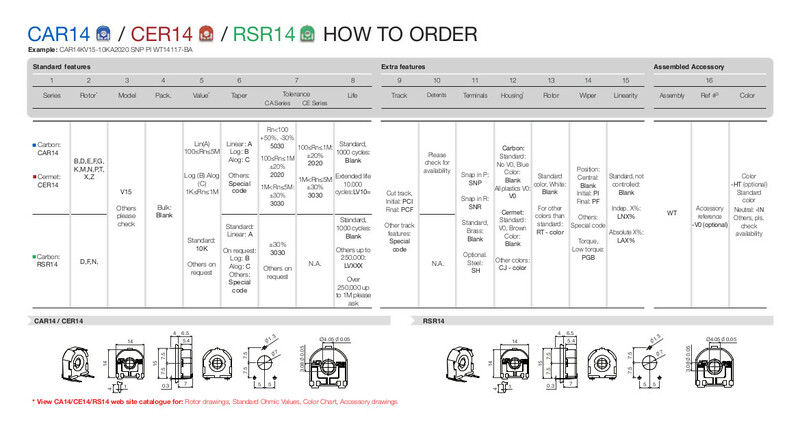 Please view CA14/CE14/RS14 web site catalogue for rotor drawings, Standard Ohmic values, color chart, and accessory drawings.